Half-marathon novice Lucian Allison ran away with the Perkins Great Eastern Run spoils today (October 14). 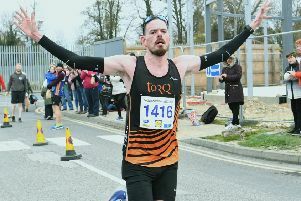 The 27 year-old from Lincoln made light work of the 13.1-mile course around the streets of Peterborough to win in a time of 65mins 27secs and land the first prize of £750. Despite the horrible conditions, Allison revelled in the rain, splashing his way through the puddles to smash his personal best (PB) by almost two and a minutes. His previous best was 67.45 set in the Great North Run last year and that was only his second ever attempt at the distance. In his first half-marathon in 2016 he clocked 75.12. “I’ve only been running for three years - I took it up because basically I was unfit and drinking too much. So I’m thrilled to bits to win such a big race. And I can’t believe that in those conditions I’ve gone and smashed my PB by so much,” he said. “It was really, really, really wet and the wind was strong going out of Peterborough in the first half of the race. For eight miles there was a pack of us all bunched together - six or seven runners - but we were getting in each other’s way. So when the wind changed on the way back I gave it a kick and surpisingly got away. “It was great to win and a bit of a surprise really but I can’t say I enjoyed it. I never expected anything like that after the training I’d done going into the race. That had all been in red-hot sunshine. “I loved the course and the support I got was mega. I couldn’t believe all those people were coming out of their houses to cheer us on seeing as it was chucking it down. Last year’s winner Tom Evans, a 27 year-old Army officer from Lewes in Sussex and one of the world’s top ultra-distance athletes, had to settle for second place on this occasion in 66:21. He was also having only his third run over the half-marathon distance and he also set a new PB, beating the 68:40 he ran last year. Evans won the bronze medal at the World Trail Championships in Spain earlier this year and won the 101k Ultra Trail du Mont Blanc over the French Alps. Shane Robinson (27), a Lincoln Wellington clubmate of Allison’s, claimed third place in 66:32 and he absolutely battered his PB. His previous best had stood at 71:04 set in the Boston Half-Marathon in 2017. Next in fourth place was Lincoln Wellington’s Matthew Bowser in 66:50 and fifth was Stamford-based Aaron Scott, another Lincoln Wellington runner, in 66:53. Scott, who has a rapid PB of 65:50, was using the race as a training run for the Frankfurt Marathon later this month. Edgars Sumskis from Nene Valley Harriers was sixth in 67:07 despite carrying an injury. First lady home in 39th place was solicitor Amy Clements from Kent AC in 74:09 - a one-minute improvement on the PB she set in the same race two years ago. Second lady was Clara Evans from Cardiff AC. She was 63rd in 76:02. Leading local lady was Nene Valley Harrier Jordan Foster, who clocked a PB of 83:06.